Here at Trieu nails we believe customer service is key. Our customers are the most significant component of the industry and it is our responsibility that clients leave satisfied, content and excited for their next visit. We are currently in the process of refurbishing, because as a company we believe nail salons have become underrated, boring and basically dated over the years. In my own experience, normally you would walk into a bland, noise polluted nail salon with dusty old posters covering the walls. All seats are taken so your told to wait your turn by an employee that, quite frankly will most likely forget your name after their second customer and the only thing stopping you from losing your patience is your dying IPhone and century old magazines sprawled across the coffee table. Yes we understand your struggle! That’s why we have decided to scrap the traditional nail salon, and introduce a more urban approach. Currently we are installing a brand new cocktail bar, in order for you to relax and enjoy your treatment with an alcoholic or non-alcoholic beverage. But if cocktails don’t rock your boat, we have also introduced our new coffee house and will be creating some of our own original cocktails, mocktails and coffees. Upon arrival you will be welcomed by our well-seasoned staff, as you first walk through the large glass door. You will almost instantaneously be offered either a champagne, mocktail or hot beverage etc. Your belongings will then be taken to a locker (you will receive key once staff lock away your belongings) and you be asked to sit down in our waiting area while the technician is prepping their station or finishing with another client. When you get your nails done, you should enjoy the experience. We believe by prepping, pampering and painting your nails we our emphasizing your beauty and confidence. 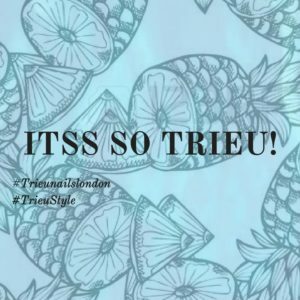 So if you love your nails, come to Trieu and receive the a-list service you deserve.